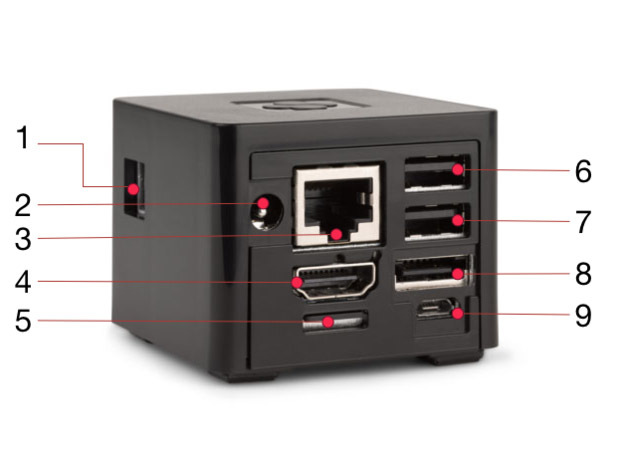 The Vero is small cube device which is made to run the newest fork of Kodi (formally XBMC) called OSMC. 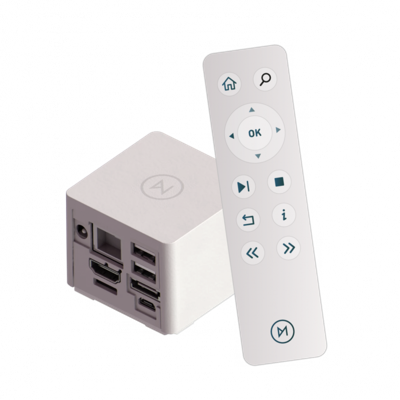 The operating system is actually based on RaspBMC for the Raspberry Pi, but anyone familiar with Kodi/XBMC will feel right at home with the setup and interface. The front face sports a flush infrared remote control port (providing both receive and transmit ability) while the adjacent face (going counterclockwise) has a optical audio out (1). 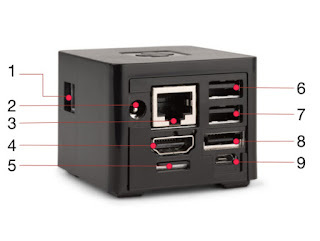 The rear face provides the (2) power connector, (3) 10/100/1000 Mbps Ethernet port (note that the 1000Mbps interface speed is limited to 470Mbps because of system constraints), (4) 1080p HDMI 1.4 port with CEC and 3D support, (5) micro SD card slot, (6) the upper powered USB port, (7) the lower powered USB port, (8) eSATA II port, and (9) micro USB to RS232 port. 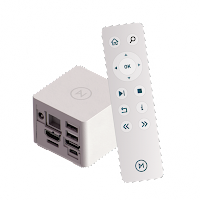 The device is a more expensive (£134 or $213) than an Apple TV and the software is still in beta. I have spent about a month using the device so far and think it can't replace my current media player. The stock OSMC theme is clean, but I prefer to use Transparency add-on because of the customization settings. The device was very easy to setup, but I did find some annoying bugs (at the time of writing this post). On the hardware side of things. The vero itself is well designed and feels solid. My only gripe is that the stock remote is kind of lacking in buttons. I would have preferred a "previous" and "next" button along with a "back" button too. Although, OSMC does support many IR remotes and has presets installed for easy switching. One downside is the device only supports 802.11b/g/n and not the much faster 802.11ac standard. The 2.4Ghz wireless band can get crowded especially in an urban environment with many access points and this can cause lag. The Vero is a nice gadget to plug in and play, but currently cannot replace my main media player.